This week, even the ‘Now’ photo is nostalgic. HERE WE AGREE, again, with the caption composers for the Museum of History & Industry’s archive. Using a variety of sources, including city directories, tax records and company signs, the MOHAI investigative staff dates this waterfront “Then” print to 1920. As I remember, the museum’s need for skilled interpreters of the mostly donated holdings in their photographic archives was multiplied a few thousand times in 1983, when Pemco Insurance purchased the Webster & Stevens Studio negatives — most of them glass — for a philanthropic gift to the museum. 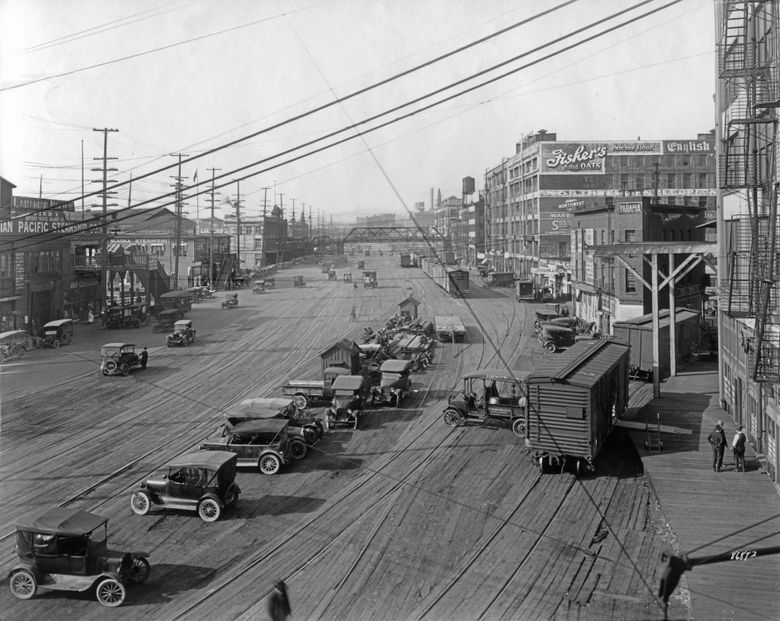 Its images, about 44,000 of them, are a fine record of Seattle’s growth, primarily through the first half of the 20th century. This week’s “Then” feature is included among those thousands. From Washington Street, the studio photographer looks north on Railroad Avenue — even above it. To his or her advantage, the sensitive recorder reached this elevated position by climbing the city’s then-nearly new trestle for carrying municipal trolleys south along the waterfront. The riders were mostly headed to the many wartime manufacturers built above the tideflats and beside the man-made Harbor Island and its waterways. Or, like many of those using the Alaskan Way Viaduct until it closed for good on Jan. 11, they were heading for their West Seattle homes. A reminder: Here we cannot see the 1919 trestle because the camera is looking north through the widest part of Railroad Avenue, which was north of Yesler Way. 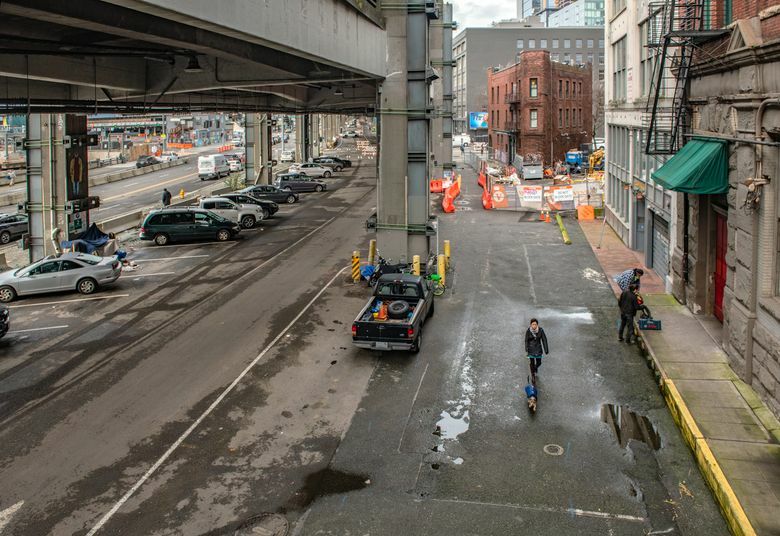 The viaduct was closed for a week when Jean Sherrard snapped this “Now” photo with his 21-foot monopod on Jan. 18.